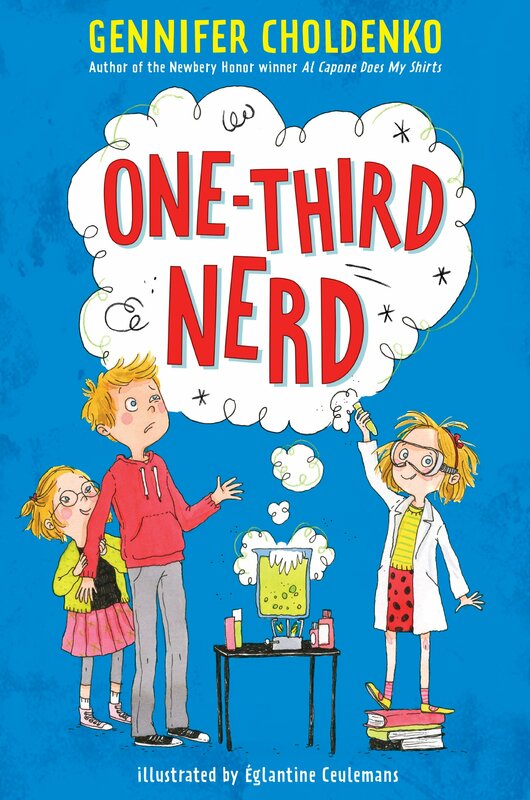 Summary: Fifth-grader Liam has a lot on his plate, what with divorced parents, a third-grade sister, Dakota, who loves science but lacks people skills, a second-grade sister, Izzy, who has Down syndrome and is a champion hugger, and a dog. Cupcake, who has started peeing on the carpet. The last issue results in their landlord threatening eviction if they don’t get rid of Cupcake. The vet has told them that they need to see a $3,000 specialist, and the kids are determined to raise the money. Dakota tries by entering a science fair and by selling the family’s possessions on eBay (without their permission), but it’s Izzy who comes up with the idea that saves the day. The ending is happy, if not necessarily happily-ever-after. 224 pages; grades 3-6. Pros: Readers will quickly warm up to Liam, who is frustrated by his family members, but ultimately a loyal and protective big brother. The story is both funny and heartwarming; the illustrations (which channel Hilary Knight) make it a good choice for younger middle-grade readers. Cons: Sorry, Cupcake, if I were the mom, you would have probably ended up moving to a farm in the country.